800 - 235 Yorkland Blvd. An environmental assessment (EA) identified a number of issues for the sewer, including environmental constraints and significant depths of construction. Accordingly, trenchless technologies were identified as mitigative measures to deal with the concerns and control costs. Upon completion of the EA, the Region authorized a consultant team led by Dillon Consulting Limited to complete comprehensive geotechnical investigations, preliminary design, detailed design and preparation of tender documents. Environmental restrictions, along with the significant depth of portions of the sewer (greater than 25 m) meant that trenchless construction methods were preferred for a significant portion of the alignment. To reduce the potential for infiltration and exfiltration, and to maximize life of the sewer, watermain-quality concrete pipe (AWWA C301 and AWWA C302) was specified for this project. A microbial inhibitor was also specified within the concrete of the pipe and all concrete on the project potentially coming in contact with sewage. The purpose of the inhibitor was to reduce the potential for hydrogen sulphide corrosion of the concrete, which plagued the existing pumping station and gravity sewer. View of the 2,400-mm pipe installed between two maintenance holes. Opposite page: Tunnel excavation between maintenance hole (MH) 8 and MH9. Maintenance hole locations (which were also shaft locations for the majority of the project) were chosen at key sites which did not encroach on environmentally- significant areas, yet provided ease of access for future operations. The holes at key locations were also designed with oversized risers to just below the ground surface. The purpose of the oversized risers was to accommodate the very large video equipment required to monitor a sewer of this size. The maintenance holes were designed in such a way that future access would be obtained by removing the flat cap located just below ground. This would eliminate the need to modify the holes for maintenance operations or the need for custom monitoring equipment that could fit within the restricted space of a traditional chimney type riser. There were a number of locations within the project limits that required Conservation Halton (CH) permits and consultation with the Ministry of Natural Resources (MNR). The project crossed four regulated watercourses and a field with bobolink (an endangered bird) habitat. 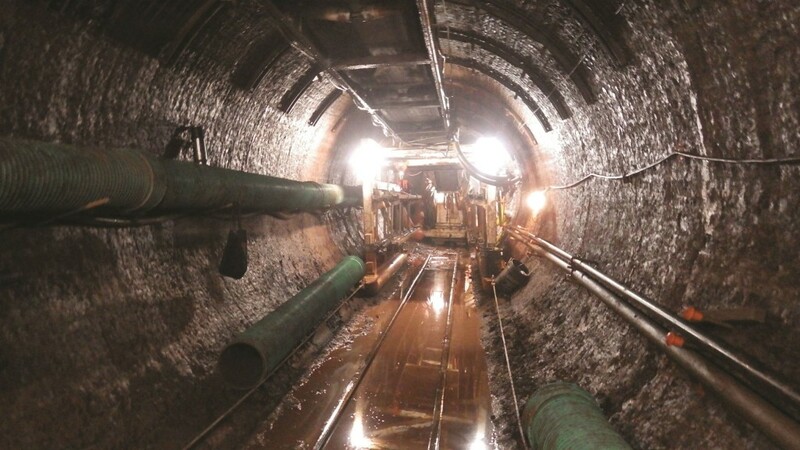 Working with both CH and the MNR, the project team was able to address their concerns by locating access chambers and monitoring points away from key areas. In order to meet the completion date, contractors engaged four separate trenchless crews and two open cut crews. To accelerate the tunnelling operation, crews worked 24 hours a day during key times. Under two separate contracts, the general and subcontractors completed four tunnel drives with three diameters (2.5 m, 3.3 m and 3.6 m) to host pipes ranging from 1,500 mm to 2,400 mm. The tunnels ran for a total of 4,545m and included a section with a 150-m radius bend. The trenchless approach also included 100 m of 3,000-mm ID tunnel liner plate that hosted a 2,100 mm pipe, and 30 m of 2,700 mm ID tunnel liner plate built to contain a 1,950-mm pipe. Dibco Underground Limited and Varcon Constrction Canada were the general contractors on the project with Varcon retaining C&M McNally and Elliott Underground as subcontractors for the tunnelling portions of their contract. TBMs used on this project were manufactured by Atlas Copco, Komatsu, and Lovat. Very harsh and prolonged winter of 2015 – contractors engaged additional crews in the spring, working up to 24 hours per day to recoup the schedule. The shale through which the tunnel was excavated contained high in-situ lateral stresses. As such, it was specified that the tunnel had to remain open for a minimum of 100 days before grouting could begin. Working with the contractor, the design team determined that due to the contractor’s larger than specified diameter tunnel, a thicker layer of cellular grout would be needed within the annular space between the outside of the pipe and the tunnel wall. This thicker layer of grout would be capable of absorbing a larger strain from the shale and the waiting period was reduced from 100 days to 10 days, further accelerating the schedule. More firmly bedded shale (less easily excavated) than anticipated – blasting of the shale layer was employed for most of the southerly open cut section. Production increased from the installation of less than one 6.1m pipe per day to approximately three 6.1m pipes per day. 2014 late start – the effect of environmental timing windows on construction was magnified on the project. Nest searches and land clearing occurred early in the project to avoid disturbing any potential nesting sites, and a temporary crossing over a regulated watercourse was installed during late winter to provide access to portions of the site isolated by the watercourse. Failure to install the crossing before the fisheries window closed could have delayed construction by more than 4 months. A revision to the pipe alignment at MH8 was proposed by the contractor to reduce the time required to potentially re-launch the TBM. The minor grade adjustments are estimated to have saved more than two weeks on the overall project schedule. These adjustments were specific to the contractor’s chosen TBM and were customized to address the land requirements along with the project hydraulics. The key social significance of this project is that it supports the local economy and prosperity. A major constraint to the potential growth of Milton was overcome. Construction of new homes continues, as well as all of the spin-off benefits attributable to new home construction such as home decorating, landscaping, and furniture purchases. This project came to fruition as a result of a strong relationship between the Region and the development community. The consulting and contracting teams worked closely together with the Region to overcome many hurdles. The result is a successful project that will greatly support the strength and growth of Milton’s economy. The tunnels ran for a total of 4,545 m and included a section with a 150-m radius bend.